Black Forbidden Things: Cryptical Secrets from the "Crypt of Cthulhu"
A similar scholarly purpose is served by the inclusion here of three draft stories Lovecraft received from the hands of his revision clients. De Castro’s “The Automatic Executioner” became HPL’s “The Electric Executioner,” while “A Sacrifice to Science” became “Clarendon's Last Test” or simply “The Last Test.” William Lumley’s “The Diary of Alonzo Typer” turned out surprisingly well as Lovecraft’s rewrite of the same name. Here, then, are three of his revision tales in the case of which we may be precisely sure what role Lovecraft had. 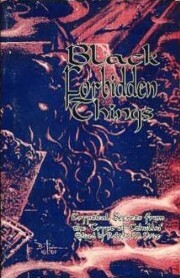 Black Forbidden Things: Cryptical Secrets from the “Crypt of Cthulhu”. Edited by Robert M. Price. Mercer Island, WA: Starmont House; 1992; ISBN 1-55742-248-6; paperback; 204 pages.